Time is your currency, your life line and you stop aging at 25. 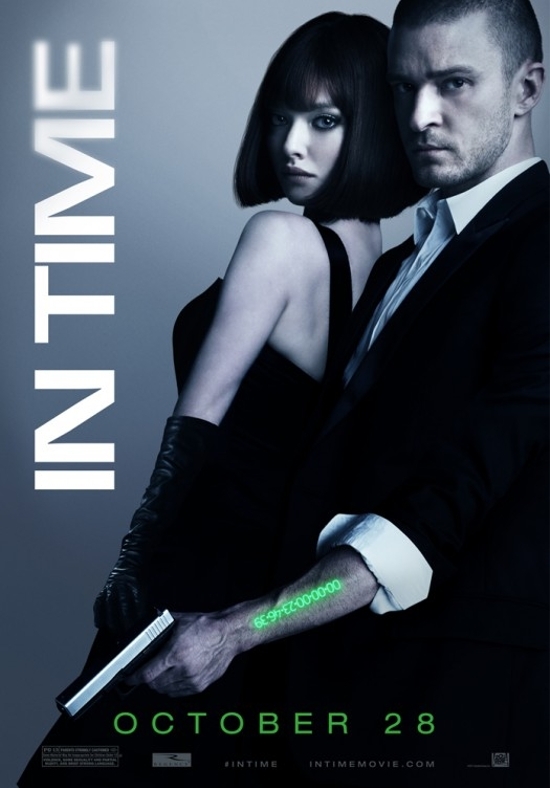 In Time takes a unique look at the world and how it currently works, using the metaphor of time. Justin Timberlake has transitioned well from singer to actor and this movie is one which proves why. He is charismatic, engaging and shows his range. Many were, and still are, skeptical of his talents but In Time shows a different side. He is aggressive and passionate and makes the film believable. Amanda Seyfried plays the haughty yet charming Sylvia. Although the portrayal, at some points, seem lacking, overall her performance is good. She portrays the role of daddy’s little princess well but unfortunately does not bring much else to the character. Although you do have admire her ability to run in heels throughout the majority of the film. The film is of a serious nature, but there are moments of humour and it is by no means a heavy watch. It features plenty of action, both through car chases and with the leads. Written and directed by Andrew Niccol, who also wrote The Truman Show. In Time does not match the standard of The Truman Show, whether that is because of the lead actors or for other reasons, it is difficult to tell. However, the same thought provoking mentality has been applied. With lines such as “for a few to live forever, many must die.” Throughout the film it tackles themes of sacrifice, rebellion and poverty. One strength of the film is the styling and costumes, think Chanel advert. This is no wonder when the costume designer was Colleen Atwood. She has worked on array of films from Edward Scissor Hands to Chicago to, more recently, The Tourist. The film raises many interesting points. It looks good and it is one that will provoke thought while keeping you entertained.